Easily my favorite Dylan record. I can respect lots of his albums, but I have to be in just the right mood to ever want to listen to Blonde on Blonde, and even Highway 61 Revisited, great though it may be, isn’t something I listen to much all the way through. But I always come back to this one. 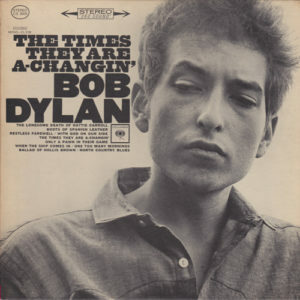 It’s got some of Dylan’s best songs, including some that are unfairly neglected in his catalog (I can overlook the fact that “Boots of Spanish Leather” recycles “Girl from the North Country”). He plays and sings with a kind of dedication that you might say is lacking on other albums, and his performances are much more effective than on his sometimes sloppy other early albums. I know some people accuse Dylan of being too serious or militant on this disc, but I have a hard time respecting anything less than that.